This Award Winning Book (London & New England Book Festivals) reveals the surprising key to feeling better, looking younger, living longer and CHANGING THE WORLD - using your Mind, Body and Water Connection. You are made up of 70% water—in essence, you are a body of water. Taking care of your inner water has a greater effect on your health—and the world—than you ever imagined. What Diana Ruiz reveals will change how you feel about yourself, others, and life itself. Join Diana on a voyage to healing your own body of water and kick-starting your Inner Fountain of Youth. Through diet, simple techniques and new knowledge, you will experience better health, relationships, increased vitality, and a boost to your Inner Fountain of Youth. To eat in a way that doesn't pollute your inner water and help you lose weight, inches and add years to your life. The surprising relationship between water and human emotions. A simple technique to relieve, phobias, panic attacks, depression, PTSD, anxiety; any type of stress at home/work simply. What an Inner Fountain of Youth is and how to rev it up. How to eat in a rejuvenating “Alkaline” way. How to boost "Alkaline" thoughts and emotions. How to turn up your "Inner Fountain of Youth". How to boost confidence. How your thoughts affect your body of water as evidenced by scientific studies. How Zombie Emotions and Moldy Oldies prevent happiness. A revolutionary simple technique to erase stress and boost vitality. The role water, oxygen, and kindness play in preventing cancer and disease. How to create age-defying relationships at home and work. How the subconscious controls us, and how we can control it. The Emotional Freedom Technique than can heal our pasts. How you can change the world just by feeling good. How to Change the world just by feeling better. Are you ready to awaken your Inner Fountain of Youth and change the world? See the amazing before and after pictures of those clients who work with Diana on her website www.HealingYourLifeWithWater.com - what will your before and after look like? Diana overcame PTSD, depression, panic attacks, social phobia to become a successful entertainer, author and speaker by using Emotional Freedom Technique (EFT). EFT is a disarmingly simple technique simple enough for a child to learn which she uses with her coaching clients to kick start their Inner Fountain of Youth (Before and After pictures are on her website). This technique transformed her life and she wanted to share it with the world so it is included in her book. "When we understand the relationship between our mind and our physical body of water, we can begin to discover the key to: feeling better, looking younger, living longer, and unlocking our inner fountain of youth. oceans in a surprising way. thoughts, thereby getting her points across in memorable ways. my favorite discussion in the book is when she talks about suffering. that there wasn't a need to suffer longer than you felt a need to." spent more time sending positive thoughts and praying for those in need. application of this book's information is a life-changer. as it was intended to do. 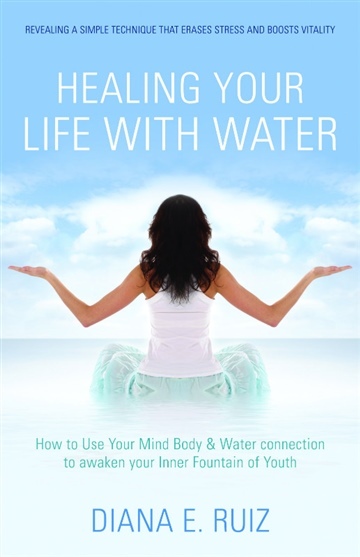 For more information about Diana Ruiz and Healing Your Life with Water, visit the author's website and check out the book video.